Create word lists from web sites on the fly. Sort lists by word frequency to immediately discover which words are most common. This is a great tool for making vocabulary lists for children to learn and thereby increase their reading abilities. Use this tool to help you discover and understand the different writing fingerprints and styles that exist in cyberspace. 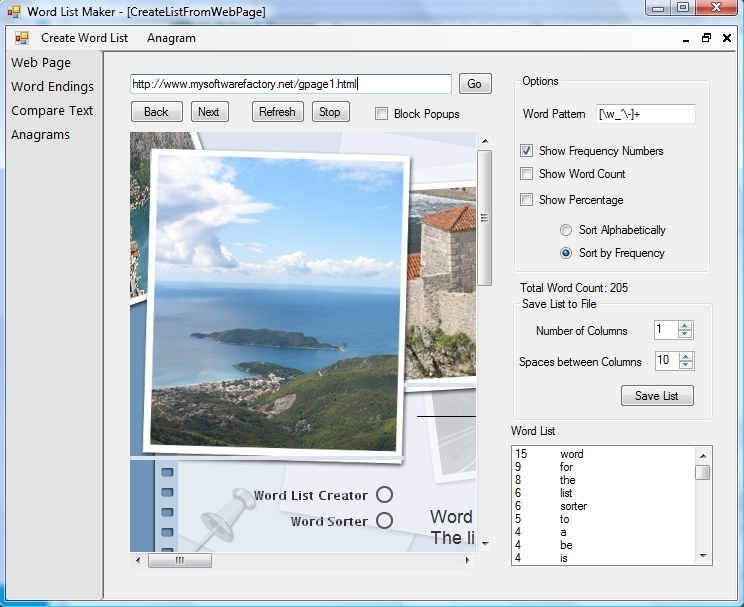 Word List Maker is a simple yet effective tool for creating lists of words. ...... Simply browse to an Internet site and instantly view the words that exist on that page. Allow the word list to be sorted either by frequency or alphabetically. Create vocabulary lists for children - or expand your own speech abilities by learning the words that others use. Word List Maker also allows you to solve anagrams. This is perfect for word games like scrabble. The anagram solver allows you to input your letters, then at a click of a button see possible words that can be formed using those same letters. It even allows you to see possible words using only some of the letters! Create glossaries or index,tool for word games. Make a list of your MP3 files with detailed information. Enables the user to extract a word list from any given text. Qweas is providing links to Word List Maker 4.3 as a courtesy, and makes no representations regarding Word List Maker or any other applications or any information related thereto. Any questions, complaints or claims regarding this application Word List Maker 4.3 must be directed to the appropriate software vendor. You may click the publisher link of Word List Maker on the top of this page to get more details about the vendor.